How many penalties has he given away in his career? As if that’s Smalling’s only weakness. The man is a penalty waiting to happen. And you know how much PSG like their dives. If you want to worry about PSG diving then Smalling should play as he is probably our best 1vs1, and not as rash the others. Against PSG we should keep a tight defence and be sharp on the counter so I would play Smalling and Lindelof. If we do get hit on the break I would rather have Smalling than Bailly. Bailly is quick but his lack of experience and lack of confidence worries me. Yea, Eric Bailly who you seem to want instead exudes calmness is not a penalty risk right? Keep telling yourself that mate. Good time for him to come back with the big month we’ve got in front of us. I don't mind veganism but claiming everything is better after going vegan (power, strength, recovery etc) seems placebo to me. If it does have an effect it will be down to paying more attention to your diet rather than the diet being vegan imo. I think it's entirely plausible. Some people's bodies have adverse reactions to eating meat and dairy, however it is not something that they can particularly notice as they have been doing it for their whole life. I became a vegan over a year ago and I have definitely felt an improvement in my energy, skin quality, and physical performance. They killed us on one corner where Matic let his man run off him. Had Smalling played we would have been under pressure from minute one instead of minute 30. Ole is now the fifth manager who has set out with him as a bench option. One of Bailly or Lindelof might get injured or have a howler and he'll get back in the team, but that doesn't mean he's anywhere near good enough for where we want to be. Thought he should have played. Much better at reading balls into the box than all our defenders, think he would have cut out the cross to Mbappe, he knows to cover that space on a cross while Bailey was trying to read Mbappe's movement. He was injured at the start of Ole's reign so that's disingenuous. Also yeah, he should have come in from Fulham and displaced Ferdinand and Vidic. Sure. And he should have been starting above them too when Moyes started. Definitely. FFS. He's not injured now though is he. He's our only real danger at set pieces from an attacking perspective. He's our 6th highest Premier League goal scorer in the last 14 months (since Sanchez signed). Sure there are questions over his passing but he's also our best defender and our only consistent attacking danger from set pieces. He comes with plenty of positives. It is odd how he’s not playing games like last night. Lindelof has improved massively in recent weeks/months but Smalling’s been our best CB based on the season as a whole. It’s hard to understand how Bailly (who’s been catastrophically bad at times this season) got ahead of him in the defensive pecking order. A lot of NFL players who have recently gone vegan have echoed the same as what Chris Smalling has said as well. Especially when it comes to tendinitis, which Chris himself has previously suffered and has since stated the condition has massively improved. Playing Smalling last night would have been a risk and is easier to say in hindsight. 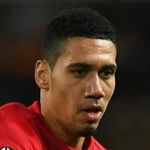 Would Smalling have made much of a difference? not to our first goal as our CBs are not to be faulted for that. The second you can argue he would have been deeper than Bailly, but again, this is all hindsight and assumptions. Overall Bailly and Lindelof did well and was defo the right two to start (could be argued Jones or Bailly given how weve been playing this season so far). However I think Smalling would have had the same problems Bailly had on their second goal imo based on what weve seen of him. I dont see Smalling as a huge difference in quality compared to what else we got, that its worth just throwing him into this game when hes had one match back since his injury. What's your point? Players lose their spot when someone comes in and does well all the time. Also, he was out for almost two months. He's not gonna be starting consistently off that. Considering that CBs aren't used from the bench as much as attackers then it's difficult for him to work his way back as easy. Ole is now the fifth manager who has set out with him as a bench option. To a large degree that has happened because Bailly, Jones and Rojo are made from glass. Blind was our main CB under LVG, Bailly in first Mourinho's year, though Smalling was our main CB last season. I don't doubt it, but that's because he's the only one who can stay consistent and fit, not because he's the best one. Played his first game in 2 months after injury, then 3 days later it was our biggest game of the season. He was never going to start that game, you can take that risk with an attacking player, but far less likely in a key position like CB, especially when those in the position had been doing reasonably well. I doubt swapping any of our CB's makes a significant difference, we were destroyed in midfield. Im not entertaining this. Smalling is our most experienced CB and also one of if not the most experienced CB in the CL in the entire league. Yes because experience is what wins us trophies. Don't be foolish, big game experience counts for a lot in football. Many a manager have stated that as a fact. Smalling has more CL and big game experience than most defenders in England. VAR and all that, I guess he knows how to trick VAR too. Our best defender by a mile, let's hope he stays fit now. "Wouldn't get a game for any of the other top clubs" "Var will expose him" "low IQ, only decent in the air"
All shite, he has been a very good defender for a number of years. They said it couldnt happen. They said that once he plays matches with VAR he'd have to retire. Beast today. Magnificent defensive display. He and Lindelof should absolutely be our first choice pairing for the rest of the season. Lindelof + Smalling. Makes sense on paper and it shows on the pitch. Is good when we're set up to counter and he can stick to what's he's good at, was twisted around a bit by Hazard on one occasion but would happen to any CB in fairness. That was a mega performance. Never been his biggest fan, but when he brings the ball out the way he did tonight and relieves the pressure, it just makes him look twice the player. Fantastic game. Proper CB performance if I ever saw one. Mike is just a super defender. The brain washing Jose attempted pre season in regards to our defence was criminal. Made us believe we had no hope of doing anything with our current defenders purely because he couldn’t coach them. What a confidence deflater that would have been to them before the season. I still feel we need one more CB, but Smalling & Lindalof have done a very good job. Are they seriously any worse than Chelsea’s? I thought it looked worse than it was, Luiz basically didn't even feel it, shirt looked like it's made from paper.